Wilmeth Sidat-Singh was the first star African-American athlete at Syracuse University. He was a dominating player in both basketball and football, playing guard for basketball and quarterback in football. The basketball team went 40-13 during his career. He was lightning quick on both offense and defense. During his senior season, he led the team in scoring. Sidat-Singh was born as William Webb, but his father died when he was a child. His mother, Pauline Webb, then married Dr. Samuel Sidat-Singh, who adopted Wilmeth and moved the family to Harlem . Sidat-Singh was an All-New York City basketball player at DeWitt Clinton High School in the Bronx . He helped the Governors to the Public School Athletic League (PSAL championship in 1933-34. He came to the University on a basketball scholarship and excelled in the sport. After a football assistant coach spotted him in an intramural game, he was encouraged to join the Orange grid squad. Sidat-Singh started his football career as a sophomore and played singlewing halfback, a position similar to today’s quarterback. He was the victim of segregation on a number of occasions. When SU played at Maryland and at the U.S. Naval Academy, the host schools refused to play Syracuse unless Sidat-Singh sat out. A season after he missed the game at Maryland , Sidat-Singh led SU to a 55-0 victory over the Terrapins at Archbold Stadium. 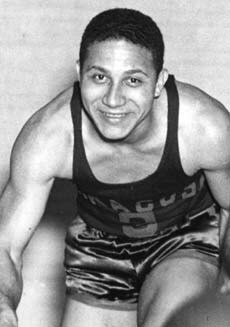 After graduation, Sidat-Singh played professional basketball with two barnstorming teams, the Syracuse Reds and the Harlem Renaissance. In 1943, Sidat-Singh passed the entrance exam for the U.S. Army Air Corps and was assigned to the segregated armed forces’ only pilot training program for African-Americans – the Tuskegee Airmen. After earning his pilot’s wings, he was on a training mission when the engine of his P-40 failed over Lake Huron and he died. Sidat-Singh is buried at Arlington National Cemetery . Syracuse University retired Sidat-Singh's jersey at halftime of the Syracuse-Providence game on February 26, 2005. He was the fifth player so honored, joining Dave Bing, Sherman Douglas, Vic Hanson and Pearl Washington.